James Perrett wrote: Is it a dual ganged pot and, if so, have you checked the other half (pins 2, 4 and 6? Are you suggesting that the odd pins form one potentiometer, and the even pins form another, independent but on the same shaft? I hadn't thought of that (probably because of the afore-mentioned 30 year gap). In which case what combinations should I test? That would be the usual arrangement, with 2 and 4 being the wipers. Hugh Robjohns wrote: That would be the usual arrangement, with 2 and 4 being the wipers. In keeping with DR R's numbering system, that would be 3 and 4 surely? The volume pot is marked A1k, so should be a 1k ohm dual-gang pot with an Audio/log taper (as one would expect for the volume pot), and the tone is marked B1k so should be a 1k ohm dual-gang pot with a linear taper. So with one of the dual gang pots being pins 1, 3 and 5, and the other being pins 2, 4 and 6 you should get a constant around 1k ohm between pins 1 & 5, and pins 2 & 6. Between pin 1 and pin 3, or pins 3 and 5, you should get a variable resistance that varies either from (near) nothing to 1k, or from 1k to nothing. Likewise with pins 2, & 4 and 4 & 6. On the tone pot, the resistance from either of the outer pins to the central wiper in the mid-position should be around 500 ohms. On the volume pot, because of the different taper, it should be around 200-300 ohms from one end pin to the wiper, and between 700- 800 ohms from the wiper to the other end pin. The above ignores any effect of other components being wired across the pots in parallel, which may affect the resistance readings somewhat (difficult to say without a circuit diagram) which could lower the resistance readings, but you should still always see a variation of resistance between the central wiper pin and the two end pins. R12 will presumably be nothing to do with the pot, and measuring the resistance of other components on the board. It looks from the picture that 5&6 are linked on one pot at the back of the board. That would make them ground. So (brain slowly getting there), would that make pins 1 and 2 the Vin for each pickup and 3,4 being the output? Many thanks for everyone's interest in the problem, and patience! Sorry -- yes, well spotted. Typo on my part! with 1, 3, 5 closest to the shaft. Dr R wrote: It looks from the picture that 5&6 are linked on one pot at the back of the board. That would make them ground. So (brain slowly getting there), would that make pins 1 and 2 the Vin for each pickup and 3,4 being the output? That would be the most likely arrangement, though it is possible that the inputs are via the wipers (3 and 4) and the outputs on 1 and 2. As the tone control seems to be a simple treble-roll off type, then it could be a passive tone type similar to an electric guitar, where the pot isn't used as a potential divider with all three pins connected, but as a variable resistor, with just two of the pins connected, one being the wiper. The pot controls the amount of high frequency passed down to ground via a capacitor wired in series with it. It may well be an active circuit, but don't be surprised if pins 1 and 2, or 5 and 6 aren't connected to anything else. There are surely tracks under those pots that you cannot see. I think you need to test for S/C links and draw a "net" of the pot wiring. Are you sure there isn't an SM capacitor rolling around somewhere? ef37a wrote: My brain hurts. There definitely are no components knocking about loose, though anything surface mount could have escaped while the guitar was away; there are no gaps on the board I can see where something might have fallen off. I am sorely tempted to take Folderol up on his kind offer and post the board to him, but that feels like giving up early! One thought - does this bass have a stereo output (like Rickenbacker's used to)? I'm trying to work out why they would go to the expense of dual ganged pots. Could it be that one half of the circuit is connected to one pickup while the other half is connected to the other pickup? If so, does the tone control not work on both pickups? Yes, I wondered that too. It does appear to have a three-core output lead from the circuit board to the output socket. It is described as having stereo microphones on the web site. The output voltage at the socket is very high compared to my active bass, as well, so it may possibly drive headphones. I'll ask, and do some more experiments. Ah! "Headphones" that makes sense of the use of the LM386s. And stereo, could be some weird phase anomaly going on? 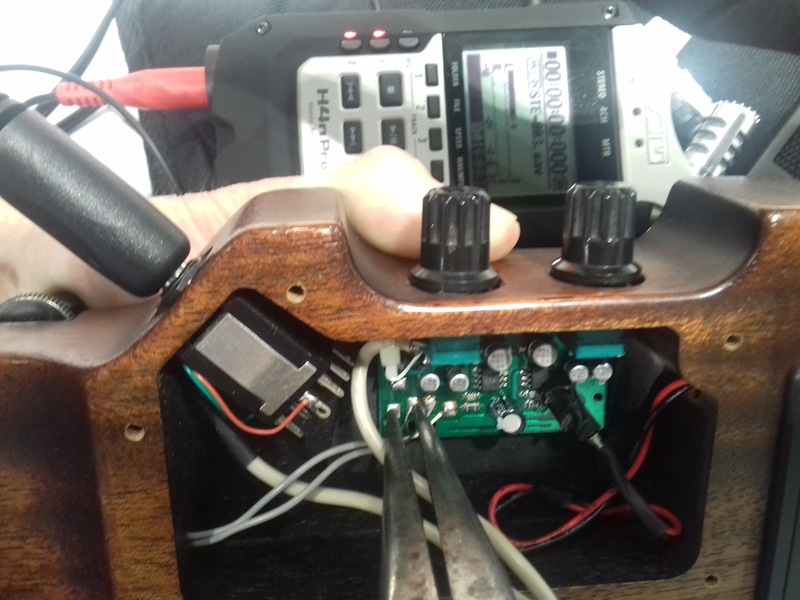 Reading around, it does appear that it is intended to drive stereo headphones directly, but can also be used like a conventional electric bass to feed an amp. Hugh is correct, the bass does indeed drive headphones directly - and really very loudly as well! all makes sense, operating as pair of potentiometers with 3, 4 as the wipers. makes sense with 1+3 / 2+4 connected together, and then operating just as a variable resistor to change the tone. So perhaps it's not the pot that is knackered after all? What's next to look at? As ever - huge thanks to everyone. The pickups in the Aria are, I think, in the tube that forms the bridge. 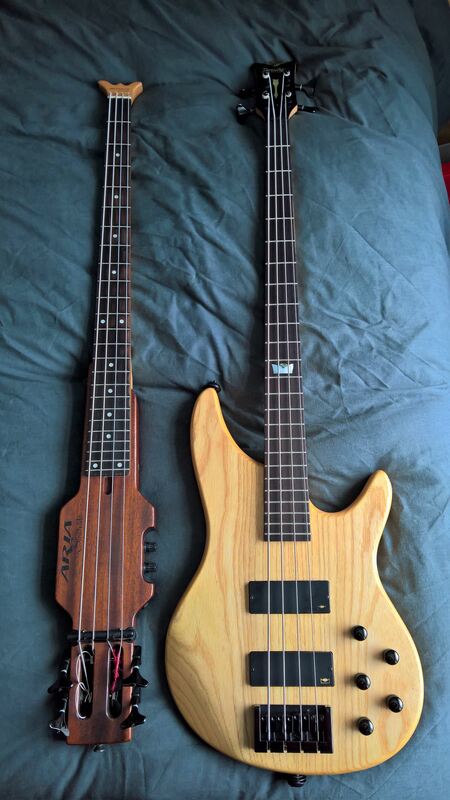 As you can see, it's a lot lighter than a typical bass. ef37a wrote: Ah! "Headphones" that makes sense of the use of the LM386s. Thanks Folderol - I take it that's a lightbulb moment? I'm don't understand how a phase anomaly would prevent the tone control from affecting the sound, though I can see how it might remove some of the bass frequency, which is also part of the problem. Dr R wrote: Thanks Folderol - I take it that's a lightbulb moment? It is often the case Rich that even quite simple electronic systems display faults that seem to make no sense and a purely logical examination of the circuit (which we have not got!) throws very little light.